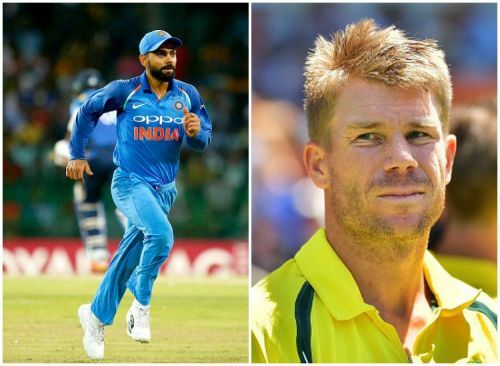 Australian batsman David Warner, who stood in for the injured Steven Smith during the recently completed T20I series, has lauded Virat Kohli's leadership skills. The left-hander attributed India's recent consistency across all formats to their captain's passion for the game. "(It has been) fantastic for last 12 months for India. Credit (goes) to Virat Kohli's leadership. His passion for the game is fantastic. He's a player who steps up and gets his players fired up", Warner told India Today. 2017 has been a productive year for Indian cricket. Even though they failed to defend their Champions Trophy title in England, Kohli's troops have consistently notched up victories across all three formats of the game. The year began with India defeating England by a 2-1 margin in both the ODI and T20I series at home. After hammering Bangladesh by 208 runs in the one-off Test at Hyderabad, Kohli's team overcame a stiff Australian challenge with a 2-1 series victory and became the first Indian side to hold all nine bilateral Test series trophies at the same time. Upon reaching the final of the 2017 edition of the Champions Trophy, India vanquished West Indies 3-1 in the ODI series on Caribbean soil. After suffering a 9-wicket defeat in the one-off T20I at Kingston, the 'Men in Blue' returned to their winning ways by clean sweeping Sri Lanka 9-0 across all three formats of the game during their trip to the island nation. India dominated the visiting Australian team by winning the ODI series 4-1. However, they had to share the spoils in the T20I series after the deciding game was abandoned due to a soggy outfield. As a result of their remarkable consistency, Kohli's team currently occupy the number one position in both Test and ODI rankings. New Zealand have already landed in India for a tour comprising of 3 ODIs and 3 T20Is. The first ODI will take place at the Wankhede Stadium in Mumbai on the 22nd. With his aggressive captaincy and non-comprising attitude towards fitness, Kohli has managed to instill a ruthless streak in the Indian team. The right-hander is also marshalling his troops by leading from the front in the batting department. Following the conclusion of the 2017/18 home season, much bigger challenges lurk in the horizon for the 'Men in Blue'. They begin a demanding round of overseas tours with a full trip to South Africa scheduled for early next year. Going by their present form, expectations are bound to be high and Kohli's captaincy skills will continue to be under the spotlight.